A variety of souvenirs including original park goods can be purchased at the entrance of Suikei-en (Japanese Garden). A variety of outdoor goods, toys and refreshments can be purchased at the entrance of Suikei-en (Japanese Garden). 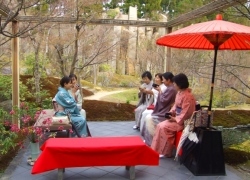 Tea ceremonies are held in the Suikei-en (Japanese Garden) during the peak season of autumn leaves. On sunny days, visitors can relax and enjoy a cup of tea and refreshments under the bangasa (coarse oil-paper umbrella) in Maple Valley, admiring the magnificent scenery of autumn leaves and cascading water. Keihanna Commemorative Park is known for its beautiful cherry blossoms and plum blossoms in spring. Why not take the park’s original spring theme lunch box prepared by “Isoji” restaurant and enjoy the blossoms? 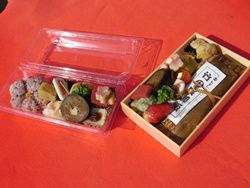 “Isoji” restaurant provides lunch boxes for park visitors. Orders are accepted from two or more lunch boxes. Pick up the lunch boxes at 11 am at the Suikei-en (Japanese Garden) entrance. When ordering 16 lunch boxes or more, please order by noon five days before your visit. The Mori no Cafe ~Nagatan~ opened for operation since March 15. 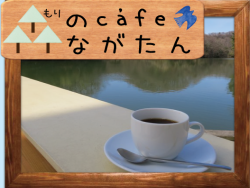 The cafe aims to serve good coffee and it is mainly operated by the “Seika-cho Furusato Annainin no Kai” (Seika hometown guide club). The name “Nagatan” comes from the local nickname of the “Nagatani Pond.” The local citizens have been calling the pond “Nagatan” out of affection for many many years. The cafe space has a huge window that you can enjoy look out to the scenic view of “Nagatan,” the garden, and the forest area. Time: 10:00~16:00 *During evening events the operating time will change. 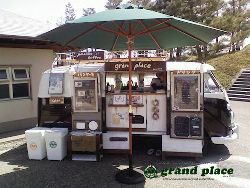 On weekends in spring and autumn, food or concession carts selling rice dumplings and other snacks will open in the Lawn Area and in front of the Suikei-en (Japanese Garden) entrance. Please drop by. *Food/Concession carts may close during bad weather. For more information, please contact the Park Administration Office. Shops *Shops may change without notice.